I read Frontline of Freedom in researching the first book in my new series “Quaker Brides.” Book one takes place in and near 1820 Cincinnati, Ohio, where my heroine Honor Cathwell joins the Female Antislavery Society. 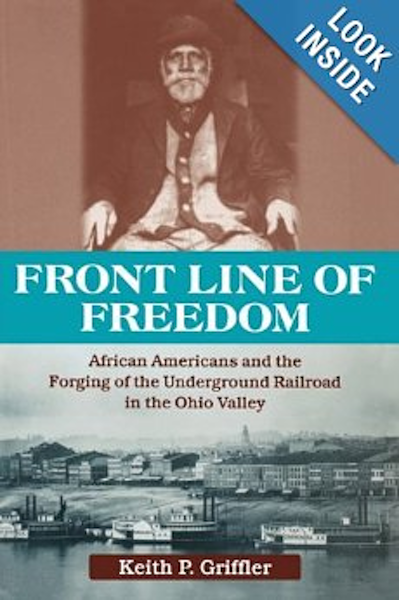 Frontline of Freedom is an excellent resource for anyone interested in the history of the struggle for abolition, the beginnings of the Underground Railroad (which began in Ohio) and the African-American and the white men and women who defied unjust laws to end slavery. As I read this, I was reminded of the many times, I’ve “lifted” actual people and events from history because truth is often more exciting than anything I could think up! NOTE: In the left column, my Pinterest board for abolition. Lyn Cote welcomes other authors to her "Strong Women, Brave Stories" blog to share stories of women who triumph over the challenges common to all women. This entry was posted in Book review and tagged abolition, African American, Underground Railroad. Bookmark the permalink.